For every Php500 gas up of Petron Gasoline or Diesel, customer can avail one (1) Batman vs. Superman gadget for only Php200. Promo duration is from February 25 to March 31, 2016 only. 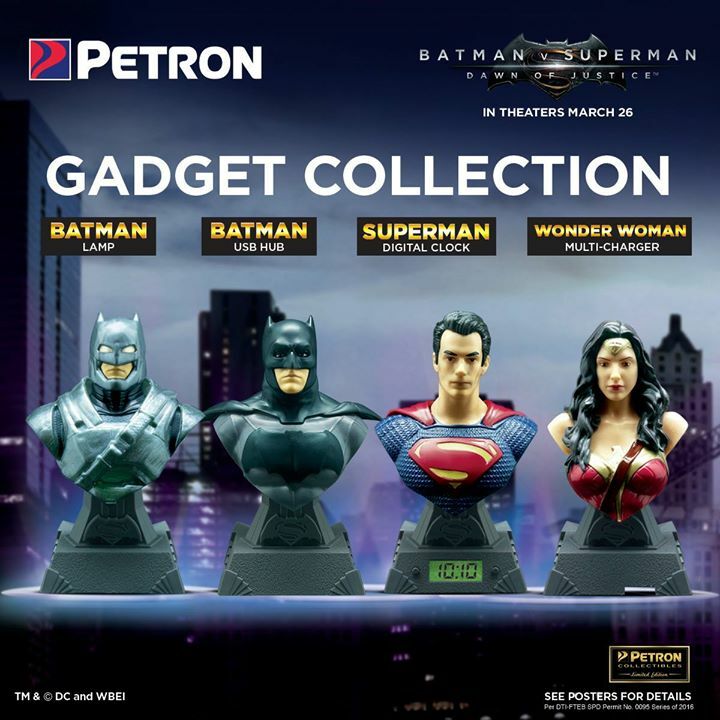 For every Php500 single or accumulated purchase of Petron Blaze 100, Petron XCS, Petron Xtra Advance, Petron Super Xtra, Petron Turbo Diesel and Petron Diesel Max Euro 4 Fuels, the customer is entitled to buy one (1) Batman vs. Superman: Dawn of Justice Gadget Collectible for Php200. Customers need to present their receipt of participating product to Service Master. Receipt will be marked ‘redeemed’ at the back upon purchase. If a receipt has been redeemed for the promo, any excess amount in the receipt shall be void and will not be used for the next redemption. Batman vs. Superman: Dawn of Justice Gadget Collectible can only be bought from participating Petron station where the customer loaded fuel (same-site redemption only). Lost or damaged original receipts will not be replaced or honored. Promotion is valid for cash and credit transactions. Fleet, Bulk, P.O. and wholesale transactions are also qualified to participate in the promo. Promo runs from February 25 to March 31, 2016. Receipts from the promo period are valid for redemption. Redemption period using valid receipts is until sixty (60) days from the end of the promo period only. Available at participating Service Stations. List of participating Service Stations can be found on www.petron.com. P.O. and Bulk customers are limited to only five (5) PCS Batman vs. Superman: Dawn of Justice Gadgets per transaction. Petron Value Card Points can also be used to purchase the Batman vs. Superman: Dawn of Justice Gadgets. Defective items can be replaced on within seven (7) days on the same station where the item was purchased. Customer must present the receipt upon presenting the defective item.